We have the best collection in the area! To order call (802) 877-2320 or use our contact form. 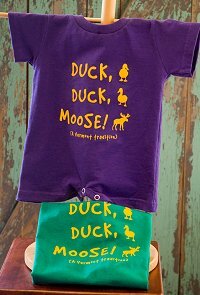 Duck Duck Moose is offered in a 100% cotton romper or T-Shirt. Romper sizes are 6mo-24mo. 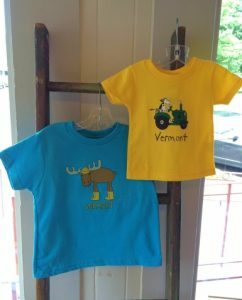 The T-Shirt is offered in toddler sizes 2, 3, 4 and 5/6. There are two colors available in both romper and tees – purple and kelly green. The romper is $17.00 and the T-Shirt is $12.00. 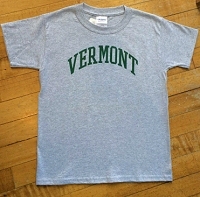 Vermont Ain’t Flat is our most popular design. Our garment washed 100% cotton tees are unisex sized and are available from Small – 2XL. 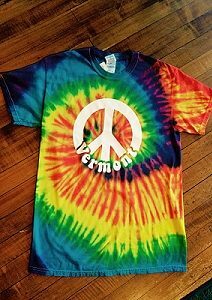 This design is available in Hemp, Blue Jean and Berry. 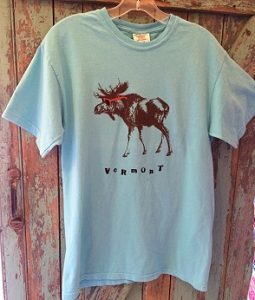 Regular sizes are $18.00 and 2XL are $21.00. 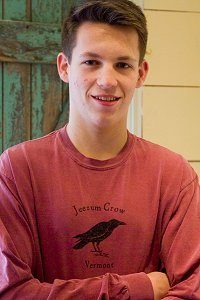 Our Jeezum Crow shirt is also a unisex 100% cotton garment died tee. It comes in short or long sleeve. 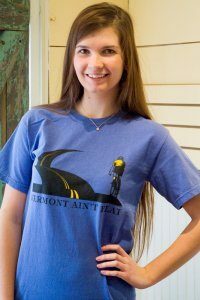 This tee is available in the color Brick only and is available in sizes small – 2XL in both the short and long sleeve. The short sleeve regular sizes are $18.00 and the 2XL is $21.00. The long sleeve regular is $25.00 and the 2XL is $29.00. 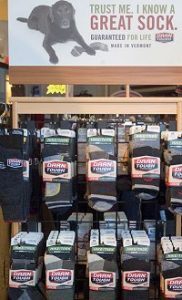 Vermont Socks (Darn Tough, anyone?) and Shirts in every size! Cute Tees for the little ones. 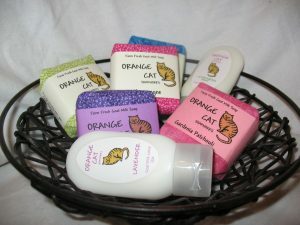 Orange Cat soaps are made right here in Addison County!! They are made by one woman and the whole operation is done right on her property, from milking the goats to cutting the fabric, to making the labels. Orange Cat is available in many scents, such as lavender oatmeal, Vermont Apple Pie, Lemon Verbena and Rain – just to name a few.